Copyright, 1892, by Cha�. K. Harris. Words and Music by Chas. K. Harris. Arranged by Frank Mayr. On the handsome father and his happy child. "Oh, look, papa, there comes mamma,"
But the father quickly drew his babe away. She has fallen by the wayside, she has gone beyond recall. "Look, there's Josie," then they turn away and sigh. In our hearts she's dead to us for evermore-Refrain. Can be seen the saddened family at home. 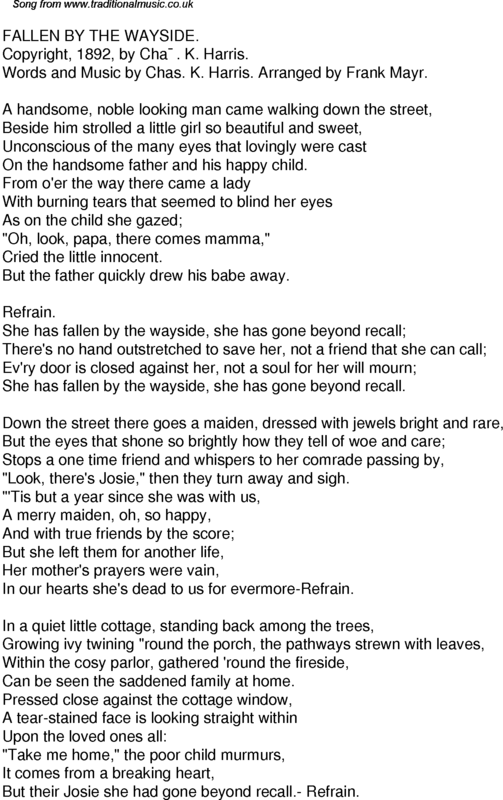 But their Josie she had gone beyond recall.- Refrain.